It’s a rare and odd sight these days to find a desk without a lamp adorning it. Whether it be a lamp on a work desk in one’s office intended to provide much-needed light, or a lamp on a more basic table somewhere in the living room generally meant to beautify the setting, table lamps can have both practical and aesthetic value. A good lamp can make it easier to read and shuffle through the papers on your desk just as much as it can say something about you, your personality and your sense of taste. To help you find the one that best suits your needs, whether you want to add a touch of pizzazz and life to your home or whether you’re simply in search of an effective light source, we’ve decided to run through six of the best table lamps out there to make it easier for you to find what you need. Beyond this, we’ll also include a buyer’s guide section and mention a few general characteristics to look out for when buying a good table lamp. Smart Lamps or Manual Lamps? The AUKEY LT-T6 Table Lamp demonstrates the old adage that big things come in small packages. It’s extremely portable (8.5” x 4”) and easy to slip into a small, dark corner to effectively illuminate an area. For added convenience, it’s touch-activated, so you can turn it on and off with a simple tap anywhere on the base. The touch system also allows you to choose between any of six different light colors – red, white, green, light blue, dark blue and purple. If you like, you can either set the lamp to cycle through all of these colors, or to simply settle on one that you like. In addition to this, you can also modify the lamp’s intensity though any of three levels – low, medium and high intensity – by touching the base. Since it’s an LED lamp, it also manages to be quite bright while consuming relatively little energy. In fact, it runs on only 6 watts when using white light and a mere 3 watts when using colored light. It’s an ideal lamp to place either on your nightstand, enabling you to do some reading before bed, or on a small desk at which you might do some reading or writing. 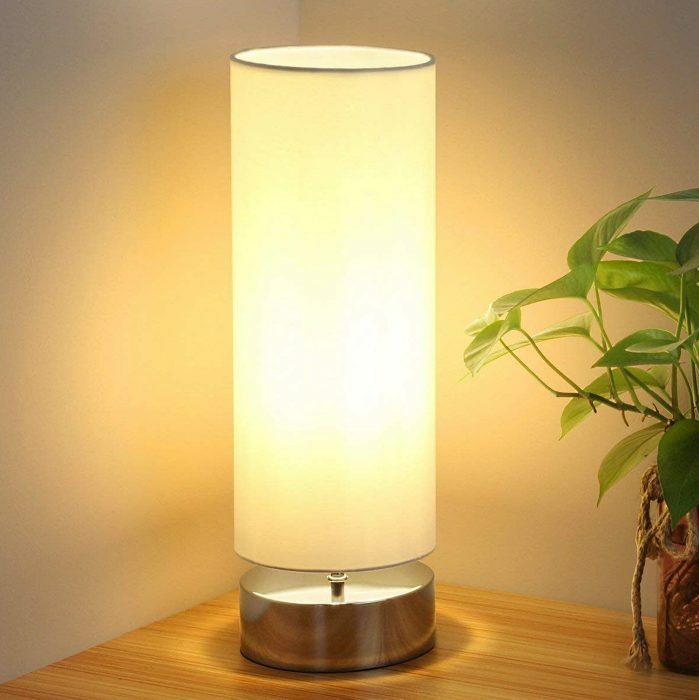 Though it’s a fairly cheap lamp that offers an array of wonderful features at a very good price, you should be aware that some users have reported occasional malfunctions, usually either involving the lamp turning on by itself without being touched, or conversely, failing to turn on when touched. Limelight’s LT2024-WHT Brushed Steel Lamp is a simple lamp with a straightforward design that gives you an effective source of light without wasting effort and space on unnecessary bells and whistles. It’s a great lamp for a practical person who just wants to occasionally light up a dark area or to be able to read at his desk or nightstand. Medium sized (8.5” x 19.5”, including the shade), it’s got a simple but polished steel base and a white fabric shade (although there are options to choose other colors) that gets the job done and diminishes the direct intensity of the bulb so that you get only as much light as you need. 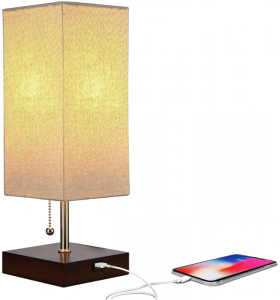 As an added bonus, this lamp has a two-pronged outlet on its base, allowing you to charge your phone with it or perhaps to plug some other device into it. The 60-watt bulb is bright and intense, and the lamp itself is compact and meant to be unobtrusive. You use a simple pull switch to turn it on and off. This lamp is perfect for office desks, bedroom nightstands, college dorms or any other area where a simple light source is needed. Those preoccupied with aesthetics might find it a bit plain (although when put in the right setting, it is able to add some flair and beauty to a room), but practical people can scarcely ask for anything better. 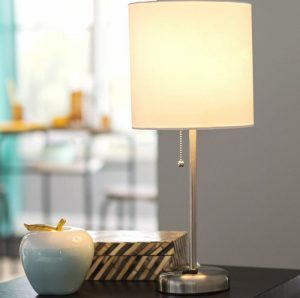 Brightech’s Grace Bedside Table Lamp is primarily designed to be a bedside reading lamp, but has so many excellent features that it can serve equally well in a number of other contexts. At only 5” x 5” x 14” in size, it’s very compact and can fit essentially anywhere – on your bedside nightstand, in a corner of your desk, on a small table in your living room, and so on. Not only this, but it is an LED light, meaning that the bulb is both extremely bright and consumes astonishingly little energy. Even though it functions on only a 9.5 watt bulb, it’s so bright when lit that one lamp alone can flood any decent-sized room with light. The light also generates a warm and inviting ambiance to the area. If that wasn’t enough, the bulb is so long-lasting that it is guaranteed to function for about 20 years without need for replacement. Just in case anything goes wrong, it also comes with a full 3-year warranty. It’s got a stylish modern rectangular shape, so that it can fit quaintly and snugly with any of a wide range of internal home decoration styles. It’s sure to complement the other items in the room – be they books, paintings, shelves, your bed, your desk, or what have you. The solid wood lamp base also has a USB port so that you may easily charge your phone, tablet or other device. You can charge your device through the USB port regardless of whether the lamp happens to be turned on or not. With an exact size of 5.51” x 16.53”, Saside Village’s Touch Control Lamp is small enough to fit compactly into a desk corner and provide you with the light that you need while also being large enough to send out enough of that light to really brighten up the area. Because it’s a touch lamp, it’s very easy to use. With four possible settings – low, medium, high and off – all of which can be toggled just by touching the lamp’s base, this lamp allows to to easily find just the right amount of lighting intensity for your needs, whether you’re reading and need lots of light to be able to see clearly, or whether you want to give a room a certain mood by pervading it with a dimmer glow. It comes with a 60-watt bulb that doesn’t flicker or malfunction or emit UV light. The lampshade protects your eyes from the discomfort of having to deal with too intense a glow. It’s got a stylish cylindrical shape that will mesh well with its surroundings and ensure that it doesn’t look out of place. 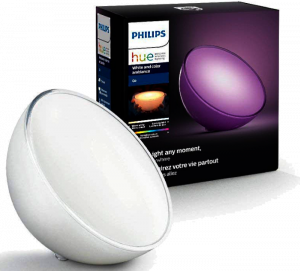 The Phillips Hue Smart Lamp is quite different from all of the lamps that we have been considering so far. In addition to being very small and somewhat oddly bowl-shaped, it’s a smart lamp, meaning that it can be connected to smart home devices through Alexa and activated merely by the sound of your voice – no switches required. It hardly gets more convenient than that. 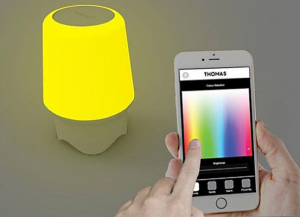 To activate the smart settings, you merely press a button on the device or connect it to the Hue Hub (sold separately) and control it via the Phillips Hue App on your smartphone. With this control, you can customize the shade of light the lamp emits by choosing between an astonishing 16 million different shades. In addition to this, the lamp is rechargeable and lasts about 3 hours on one charge. Unlike all of the other lamps that we have discussed so far, there’s no need to plug this one into the wall and you can carry it with you to give you light wherever you need it. 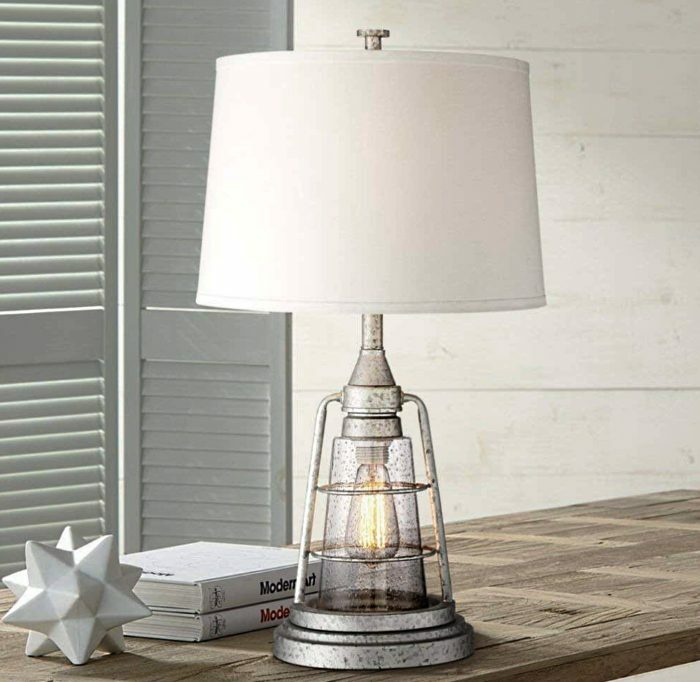 This elegantly constructed and classically styled table lamp by Franklin Iron Works will beautify whatever area of your house its placed in, though its made in such a way as to be especially useful as a bedside lamp. The reason for this is that it has two lights: one main light on its top portion beneath its lampshade, and a secondary night light inside of the body of the lamp near the bottom. The main light bulb is a 150-watt bulb that shines brightly and powerfully, guaranteeing strong and confident illumination. The night light, on the other hand, is a smaller 4-watt bulb made to provide a dim and gentle light in case you ever need some help seeing your way around in the dark. The night light bulb is an LED light. 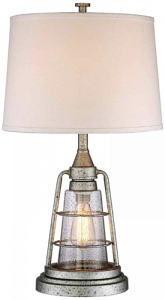 The base and body of the lamp are hand painted with a galvanized metal finish that makes it look sleek and appealing. It’s also larger than the other lamps that we’ve mentioned here (28.75” x 16”). While this lamp is quite expensive, it’s worth the price if you want the right combination of elegance and performance. Now that we’ve discussed a few of the top table lamps available, we thought we’d take some time to speak more generally about just what makes a good table lamp and just what it is that you should be aware of as you shop around for one. 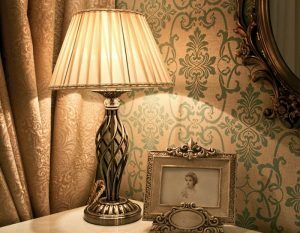 In keeping with our earlier division between the aesthetic and practical value of a lamp, we’ll discuss both the technical features of desk lamps, like wattage, energy consumption and the brightness and size of bulbs, and the stylistic elements, such as form, the type of lampshade used and what lamps might add to the look of a room under various circumstances. Since there’s no such thing as a universally “best” table lamp for all people and all situations, the first thing to do before deciding which table lamp is best for you is to form a good idea of exact what it is that you want or need. To do this, we recommend asking yourself a few simple questions. What is my intended purpose for this lamp? What intentions do you have for your lamp? What do you want to use it for? Do you want a reading lamp that will illuminate your surroundings while you’re at your desk, or would you simply like an aesthetically appealing piece that livens up the setting around your desk or goes with a piece of art or furniture that you might have nearby? If the former is closer to what you’re looking for, choose a lamp with a higher wattage and a more powerful bulb. If the latter is closer to what you want, aim for a low-watt lamp that doesn’t consume much power but that looks nice. Since questions like this can be posed in all sorts of combinations, it will be up to you to think about exactly what it is that you would like from a lamp and what you envision doing with it. Your answers to such questions will determine what kind of lamp suits you best. Where do I plan to put this lamp? Setting matters, both for aesthetic and practical reasons. Aesthetically, it matters because you’d want everything in a given setting to match and look right as a whole, and what matches with what ultimately depends on the setting under consideration. Practically, it also matters because the things that are of use in one setting may not be of use in another, or may have a different use in that other setting. A small reading lamp on your night stand may give you enough light to read a little bit just before bed, but place that same lamp on a work bench i your garage as you’re working with tools and it will do little more than needlessly take up space. For these reasons, it’s crucial to ask yourself where you’d like to put a lamp before you choose to buy it, and whether some particular lamp would be good in that place. What does this lamp say about me? This is usually thought of as a strictly aesthetic question. If a lamp has a certain form or is of a certain style that you find appealing, that can communicate something about your tastes, and, by extension, about your personality. Do you like modern-styled lamps that are sleek, clean and polished? Or are you a traditionalist at heart who finds the old classic styles irresistible? Which of these jives more with the rest of what is in your home, or with the part of your home in which you intend to put the lamp? Although this question is usually seen as aesthetic, a solid focus on practicality can also communicate something about you. A powerful lamp that floods an area with light, uses power efficiently and is simply designed can let people know that you have your feet planted firmly on the ground and care about what works. So when choosing a desk lamp, be sure to ask yourself: What kind of a message do I want to send? Technology has advanced a lot and continues to advance apace. Now, it’s possible for anyone who wants to to buy a lamp that can be integrated into their home wifi network and that can therefore be turned on or off remotely. This provides a lot of convenience. Suppose that you’re about to doze off but can’t quite fall asleep because a lamp in the room remains on. If that lamp is too far away to reach, you may have to stir yourself from bed, walk over and switch it off – which can be annoying, to say the least. But if that lamp is a smart lamp, you can just switch it off remotely, through a system like Amazon’s Alexa, by saying that you want it to turn off. It’s simple, hassle-free and convenient. It’s also kind of futuristic and cool. On the other hand, such smart lamps tend to cost quite a bit more than most traditional alternatives. If you know that your lamp is going to be well within reach on the night stand by your bed, you might be better off saving yourself some money and just buying an ordinary manual lamp. As with all things, your decision on this point depends on what you want to do with a lamp and what you anticipate will happen. A light bulb should be completely covered by the lampshade on your lamp. If it isn’t, this will create an irritating glare that will hurt your eyes, especially if you’re talking about a more powerful lamp. Light bulbs also come in various wattages and with various levels of brightness and electricity consumption. You’ll have to balance out all of these factors and match them with your needs when thinking about which lamp to choose. How bright is this lamp compared to how bright I need it to be? How much power does it use compared to what I am willing to pay for electricity? Is the lightbulb that it uses proportional to its lampshade, or will I have to get a different light bulb/lampshade that is? Proportionality is one of the keys to getting the right look to just about anything. As far as table lamps are concerned, you should should strive to have them be proportional to both the table on which they’re placed and the overall room in which they are. Some simple common sense is really all that is in order here. Your lamp should neither be so small that it’s dwarfed and rendered insignificant by a massive table, nor so large that it leaves next to no room for anything else to share that table with it. Similarly, a large room will require a larger and more powerful lamp to properly illuminate it, while a smaller and weaker lamp is acceptable for smaller rooms. Try to place lamps in especially dark or shadowy areas so that you can illuminate them. Taller and brighter lamps should be placed father away from you, especially if you plan to use them for reading. For smaller reading lamps, the lampshade should be about even with your head. Try to place your lamp somewhere where there are items whose colors and shapes match those of your lamp, so that things appear properly placed. Unsurprisingly, when it comes to table lamps, price and quality are usually correlated just as they are when it comes to nearly every other product. More expensive lamps tend to be made of finer materials that not only look better, but that are also generally longer-lasting. The light bulbs that come with longer lamps tend to last longer, to deliver more power and brightness per unit of electricity. 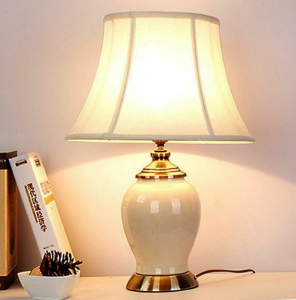 The lampshades of more expensive lamps are also generally made of better-quality materials. The same can be said for essentially every relevant characteristic of a table lamp. 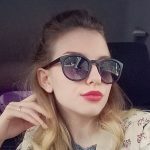 The decision of how much more to pay in return for quality, versus how much money to save in return for accepting something a bit shoddier is, of course, an individual decision that varies according to every shopper’s needs and situation and that each person must make for himself. But you should always be aware of the existence of this trade-off when you make your decision. A major theme of ours as we’ve discussed a number of particularly excellent table lamps and guided you to finding the best one for you has been how to strike the perfect balance between utility and aesthetics. The main purpose of a lamp is to provide light, but you obviously also want a lamp that looks good as it does so. We’ve endeavored to show you a few table lamps that are sleek, attractive, functional, efficient and that just plain look cool. Along the way, we’ gone through touch lamps, smart lamps, traditional switch lamps, and lamps that come in a number of different shapes and sizes. We hope to set you on your way to getting exactly the kind of table lamp that you need, no matter what you happen to need it for.